Grid Coating Pen: Coat-Quick "G"
PAP Pens are used for immunohistochemical applications. The hydrophobic properties allow the user to draw barriers on the slide, in any pattern, to confine the flow of reagents to a defined area. A minimum of valuable antiserum will be used. Visible marking is light green/blue and can be removed with Xylene. For immunohistochemistry, the PAP Pen should be applied after deparaffinization. Deparaffinize tissue sections and hydrate to water. Wipe away excess liquid around the section on the glass slide with tissue paper. Encircle the tissue section or draw lines on both sides of the section and let dry (10-15 seconds). Soak slides in PBS. Adhesive pen for paraffin sections. A coating of the glass slide will prevent paraffin sections from falling off or wrinkling. Will flatten sections in room temperature water. Stable to 120° C.
A light touch with this pen will provide a thin layer of adhesive on the grid. Layer will dry in 1-2 minutes at room temperature and is then ready to receive the sections. Pen may also be used as pretreatment before coating grids with formvar or other thin films. 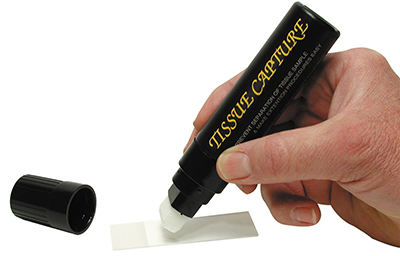 The ImmEdge Pen, a hydrophobic barrier pen for immunohistochemistry and in situ hybridization detection methods, is designed for use with frozen or paraffin-embedded tissue sections mounted on glass slides. The ImmEdge Pen provides a water repellent barrier that keeps staining reagents localized on the tissue sections, prevents mixing of reagents when differentially staining two sections on the same slide, and allows the use of less reagents per section. The boundary deposited by the ImmEdge Pen is lightly colored and easily visible. It is insoluble in alcohol and acetone, but is removed by most clearing agents. The ImmEdge Pen is compatible with all commonly used enzyme or fluorescent-based detection systems.